This is a show that I get very excited to see. There is always a strong focus on furniture. 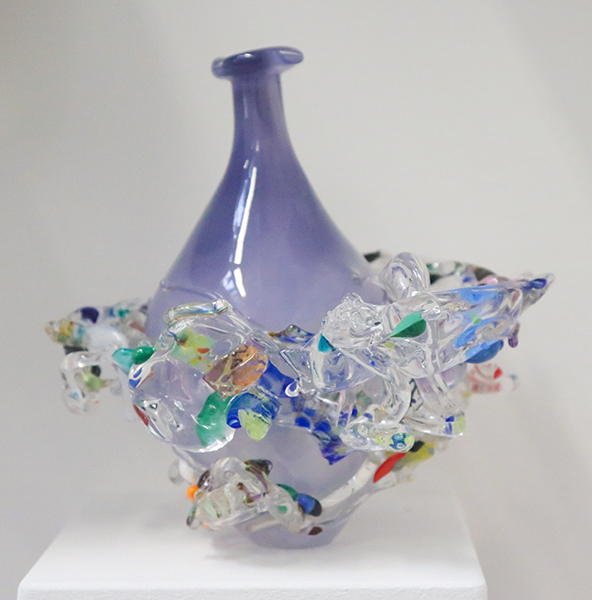 It’s very rare to be able to see so many beautifully hand-crafted pieces in one show. 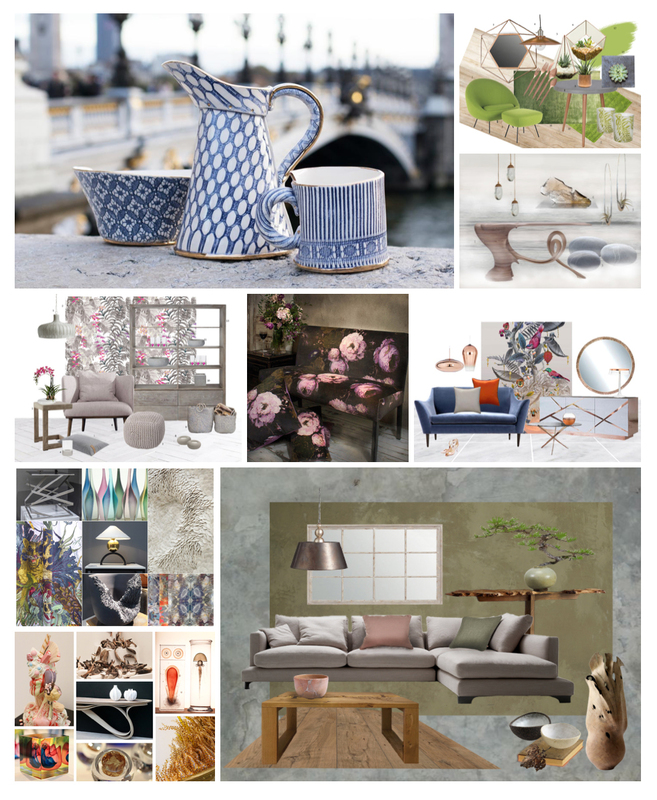 There’s a real mix of designs, from classic to contemporary and some very clever pieces that you just have to play with. I was excited to see what new directions the furniture designers were taking this year. There was so much to see, that I’ve had to do quite an edit with the photographs. I have only been able to highlight a few of the talented craftsmen that were on show, so I do hope you get a chance do go along and meet them. I chatted to exhibition Director Jason Heap when I arrived and he’s noticed that most of the Designers have brought smaller pieces along for the show this year. He said this may be in response to the market for more adaptable furniture. Homes in London may be expensive, but they don’t necessarily have large rooms and smaller furniture is far more flexible. 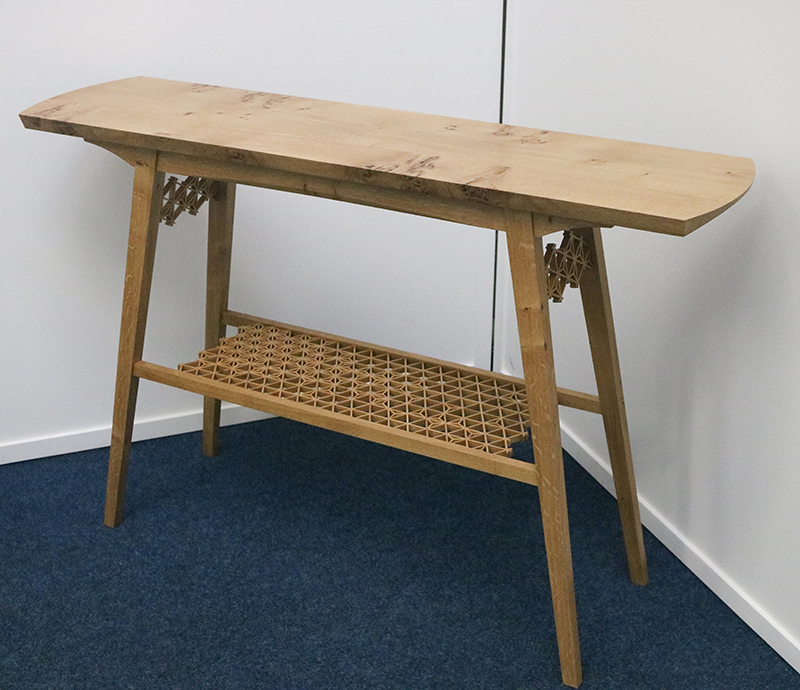 On show are desks and dining tables that are adaptable, which I feel seems to be a growing trend. I wanted to start with the amazing expanding table by George Johnson. I have seen this demonstrated by George before and I never tire of seeing his tables transform. The technologically is brilliant and fascinating to watch. 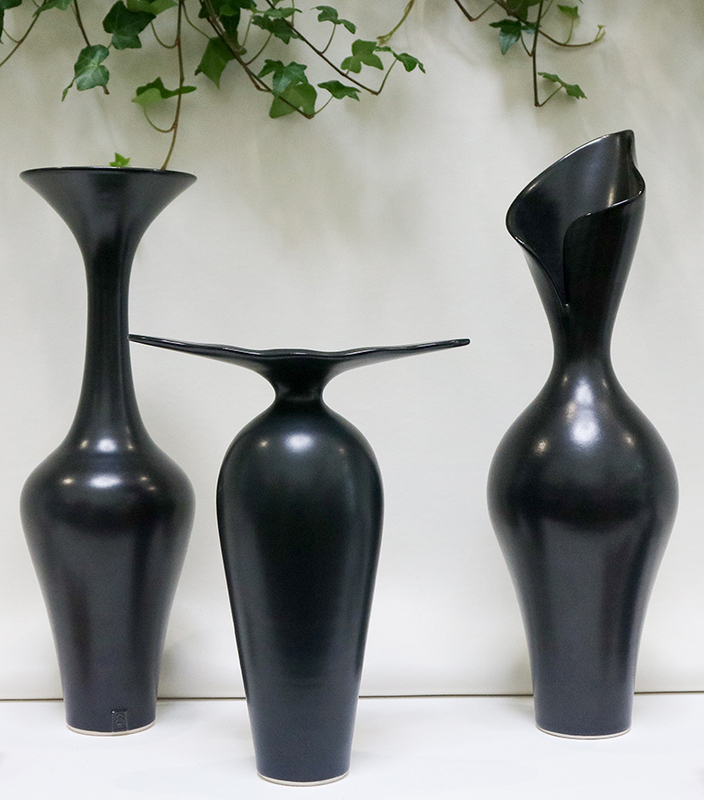 He continually refines his designs and this year is featuring organic root-like legs on the base. 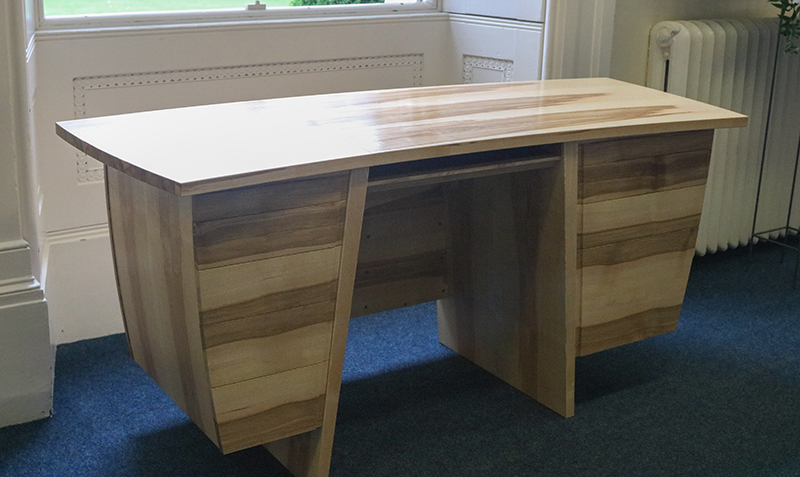 To move on from expanding tables – we now have transforming desks. 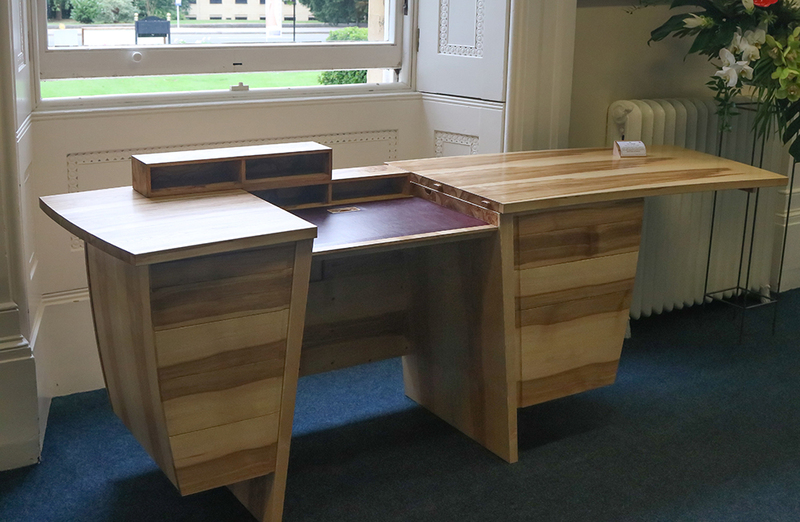 A great design from Daniel Lacey – ‘The Cromwell’ in English Oak, Burr Ash and Leather. A sliding top reveals your hidden laptop and several other discrete drawers and secret compartments. It was great to meet Thomas Whittingham again this year. The ingenious secret pop-up bar in his Riven sideboard show-piece last year was a real winner. 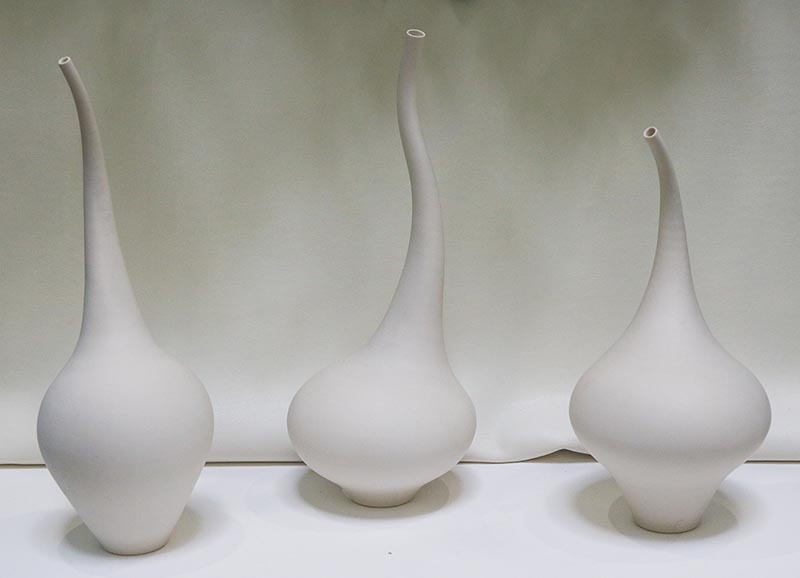 This year Thomas is showing how he loves to combine flowing curves and crisp forms. 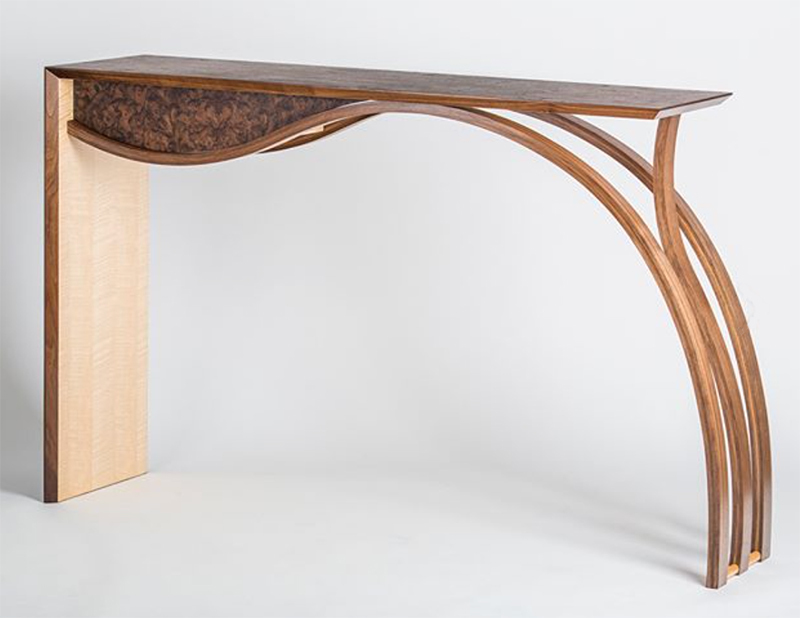 His elegant Drift console is made from Burr Walnut and Figured Maple. 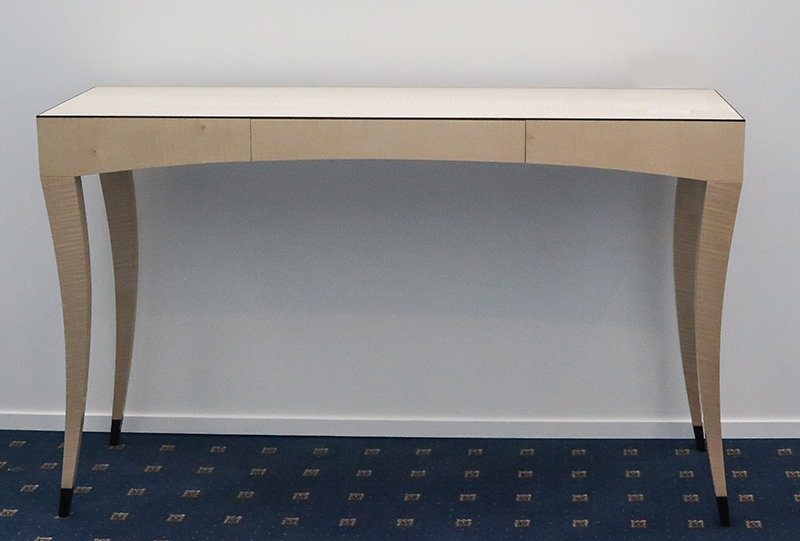 Another piece that I admire for its simple design is this elegant ‘Flaunt’ dressing table by Tom Eddolls . I love the subtle colour mix. 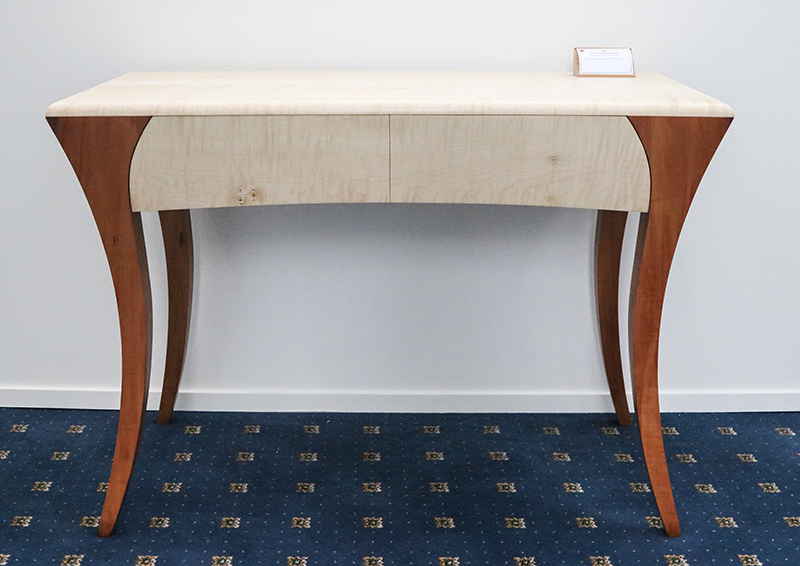 It’s made from rippled Sycamore and Pear with elegant legs that create a sweeping frame. 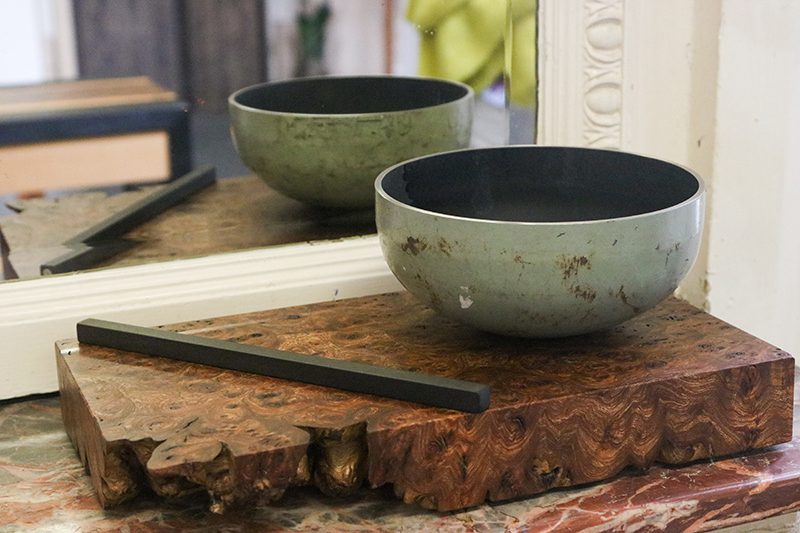 Also in a similar style the ‘Zsa Zsa’ Console table by Miklos Alexa, in rippled Sycamore and Ebony, an elegant pared down design. 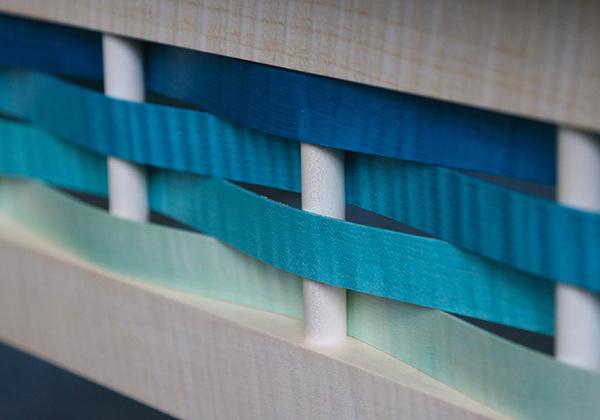 Anthony Dain uses Japanese joinery techniques to create his work. With joints in the wood so tiny that he uses a syringe to place the glue. 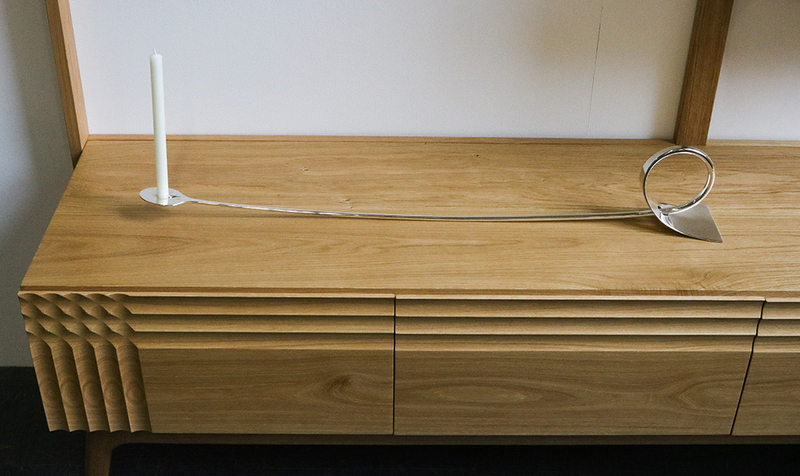 This is his table in English Oak with hexagonal ‘Asa-no-h’ Kumiko shelf. Nick James uses traditional woodworking techniques. He studies the flow of the grain before he makes a decision about how to use the wood. 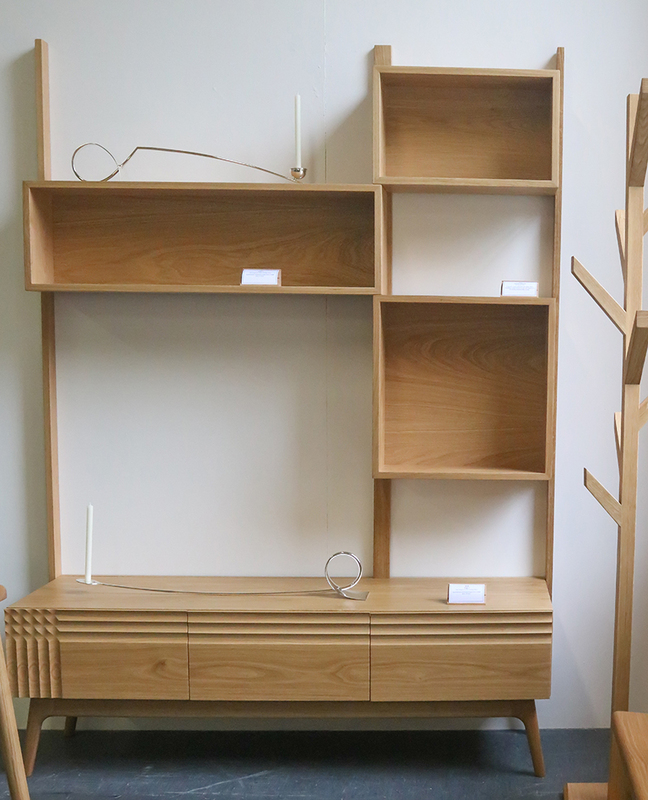 I loved the contemporary style of his Flute collection cabinet in European Oak. 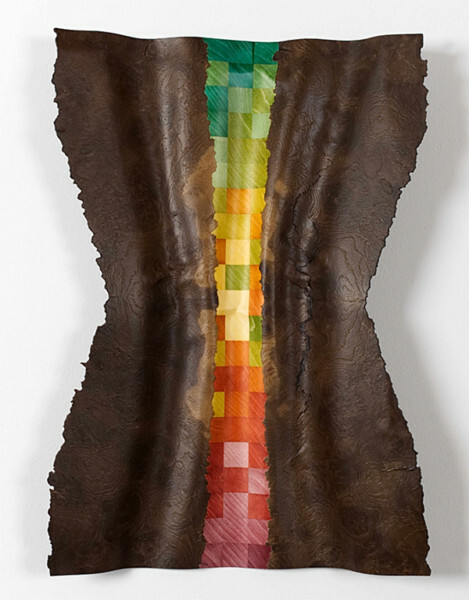 Always one to watch – this year, artist/designer Kevin Stamper is showing his abstract wall art. 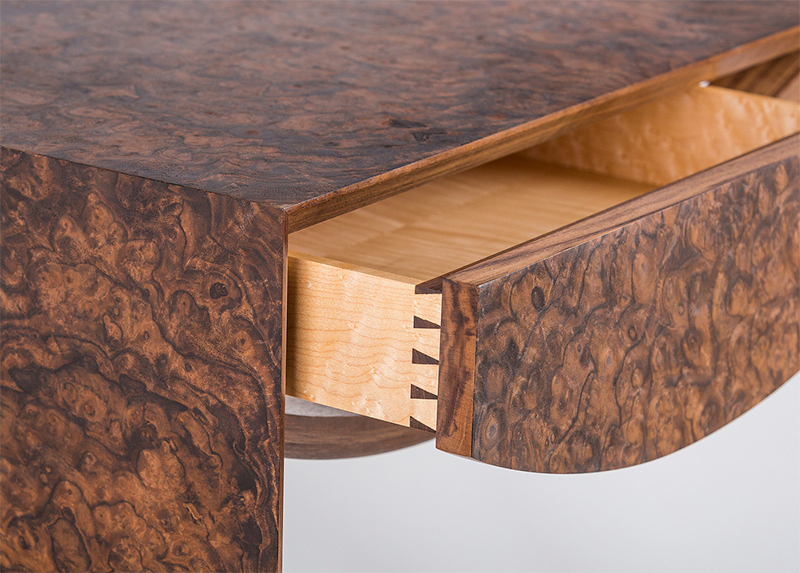 His signature hand dyed sycamore veneer is in-laid in panels of fumed Burr Oak. Kevin has also supplied Jason Heap with his colourful veneers. From which he has created the contemporary ‘Wabut’ collection. With graduating colours endlessly woven to create his designs. 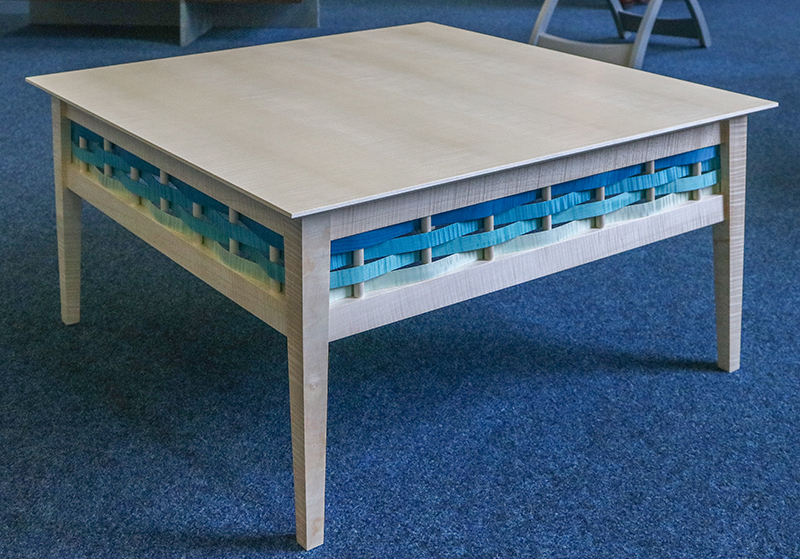 I was surprised to see glass used so creatively in furniture this year. Nick Allen‘s ‘Sentinel’ cabinet was a real show piece. It made me smile to see it described as a ‘collectors piece with attitude’. It certainly had that! 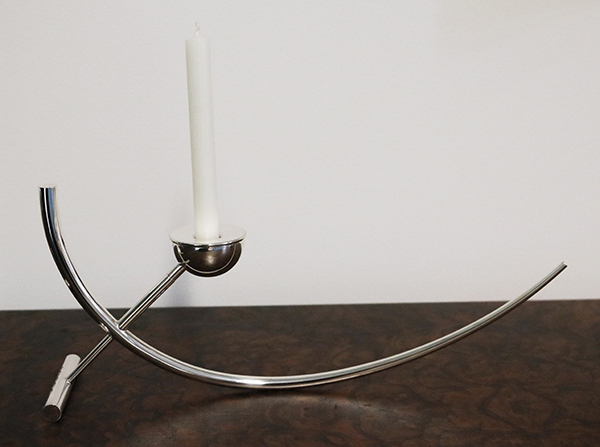 Standing 2m tall, it’s made from cast glass, stainless steel and fiddle-back sycamore. The ice berg effect on the glass is intriguing and I can imagine it being a great cabinet for curiosities. 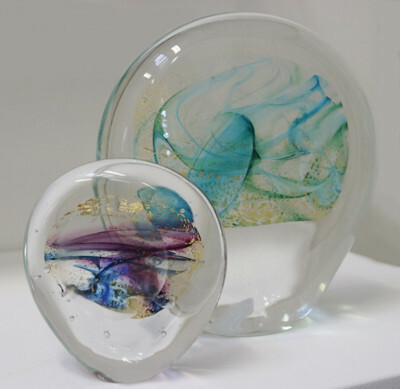 Also on the glacial theme this year Anne Arlidge is showing her ‘Meltwater’ group of work. Inspired by water flowing under, through and over glass. Almost all of Anne’s work is recycled lead crystal glass. Adam Aaronson this year is showing his pretty Fantasy Jewel collection and I also liked these beautiful Sanctuary sculptures. Master thrower, Vivienne exhibits widely with her beautiful work at several Museums in the UK. 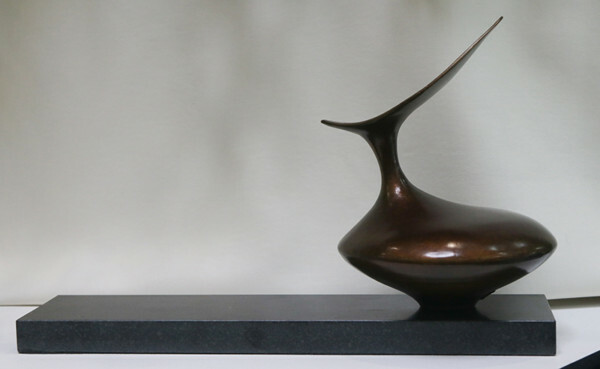 Her most recent work is a series of bronzes cast from her original sculpted porcelains. After serving 24 years in the army Andrew Harrison was the first soldier be sent on a Sculpture course and hasn’t looked back since. Using mainly British timber, he sculpts forms that highlight the natural flaws and details in the wood. I can see the Military influence in Andrew’s designs, a faint resemblance to aircraft wings and military emblems. Brett Payne is a contemporary silversmith. All his pieces are hand-made, hot-forged or hand-raised in solid silver. 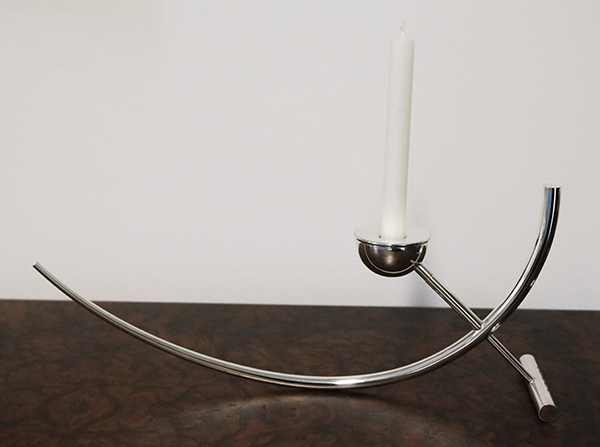 There’s a beautiful simplicity to his designs – his elegant ‘Argo I’ candle stick is hot- forged in just one piece of silver. I couldn’t resist including the modern day Gong by Suzanne Hodgson. It’s actually made from a recycled gas cylinder. Both the insides and rim are polished to perfection and the outside is left with original distressed finish. When I hear it’s chime – it makes me feel every home should have one! Finally I was interested to see the long anticipated collaboration between two makers that I love to follow – Dan Morrison of Blottworks and Paul Parry of Bad Dog Designs. 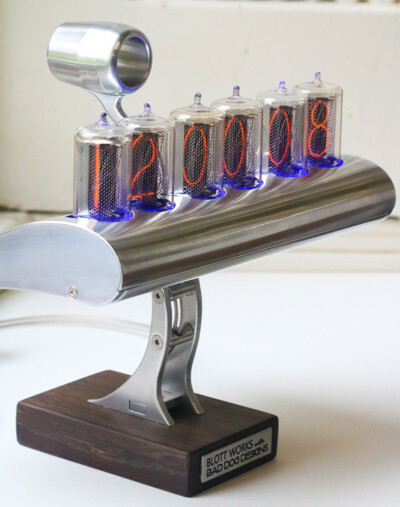 Whilst Dan’s work is an ingenious mix of hand crafted sculpted engineering, Paul recycles instruments and Nixie tubes to create amazing clocks. The result of getting these two heads together has produced a collection of Aviation inspired Clock Sculptures. They have a individual style that you just cannot pigeon hole. They are too sleek to be industrial – to refined to be steam punk, and too space-age to be retro. 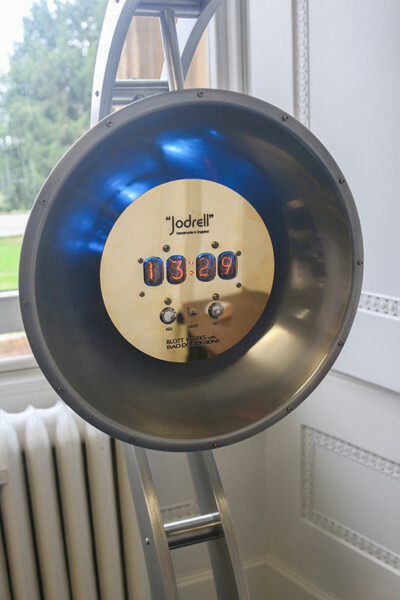 They are showing two desk top designs and a rather impressive floor standing model – the Jodrell Grandfather Clock . I hope you have enjoyed our brief glimpse at what the show has to offer this year. 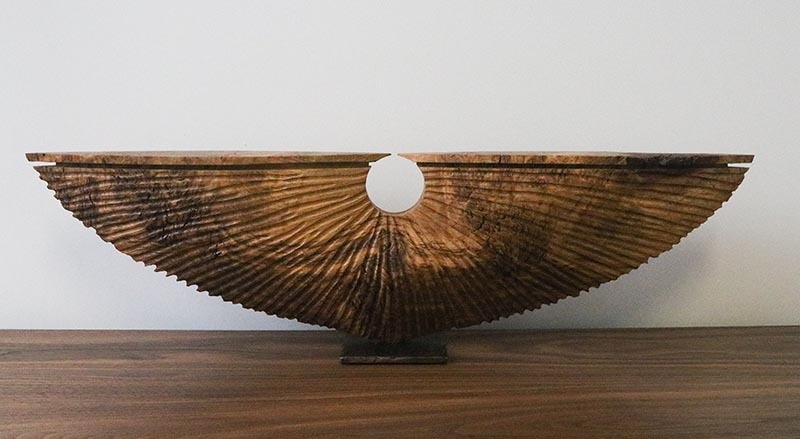 We are showing more work from Kevin Stamper on our Craftsman pages and also the talented duo Dan Morrison of Blottworks and Paul Parry of Bad Dog Designs. 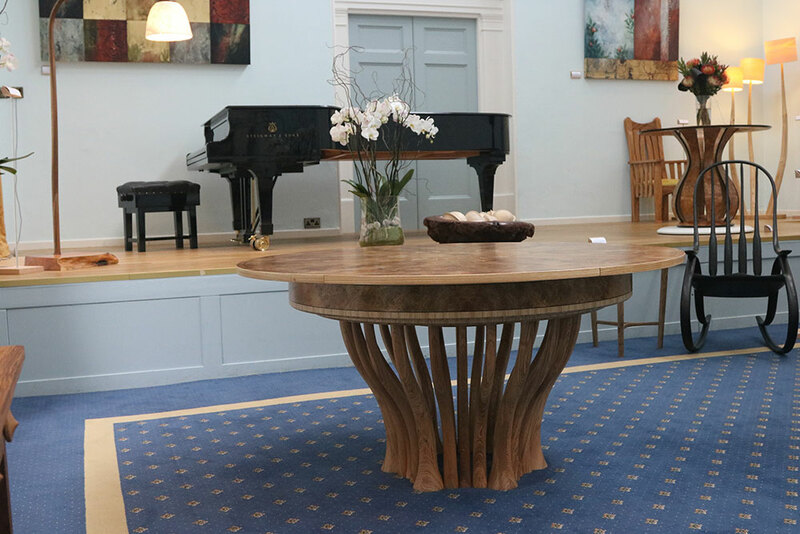 If you can get to Cheltenham – do go along to the show it’s on until 27th of August. 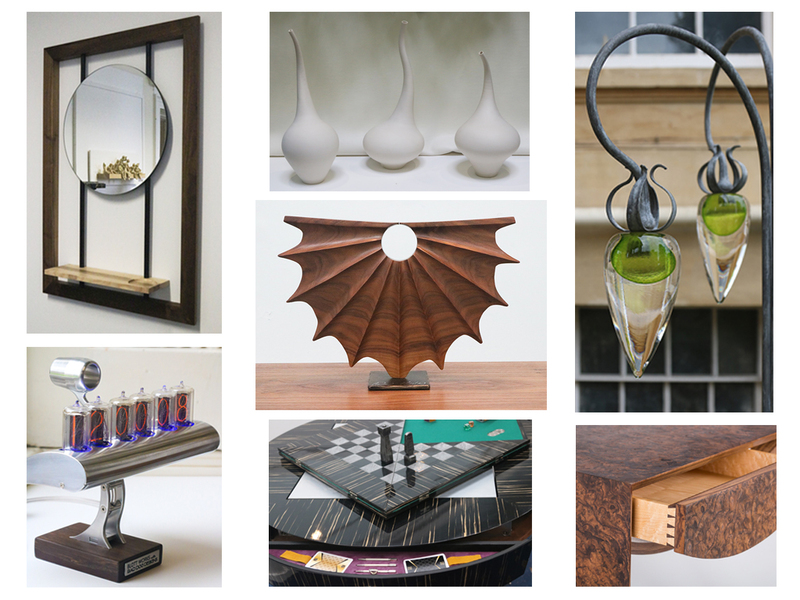 More info on the Celebration of Craftsmanship & Design website. 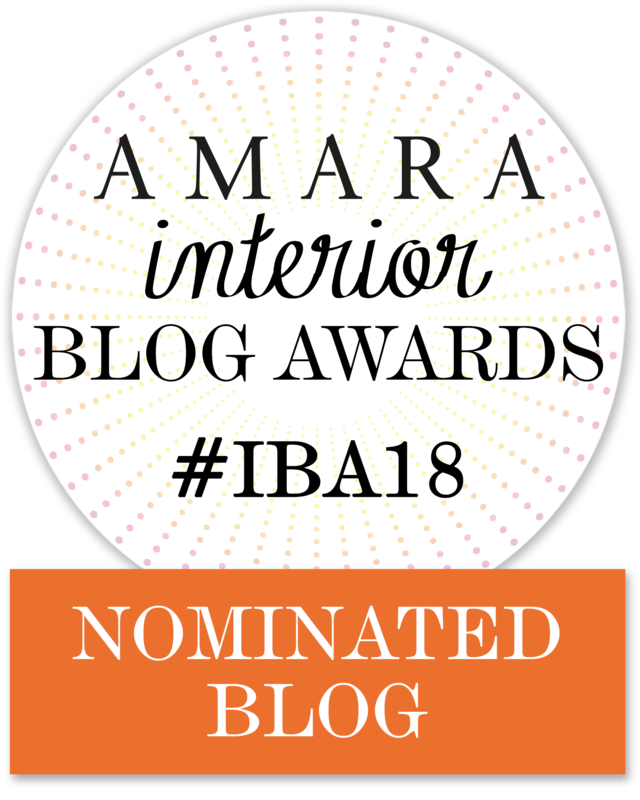 This year we are very excited to be nominated for the Amara Interior Blog awards! ? AND – if you vote for Style&Co you get a chance to’ WIN a Leica Camera !! Just click on the badge below to get you there – thank you ! Thank you for your lovely comment Maria. It’s always a pleasure to show such talented makers. 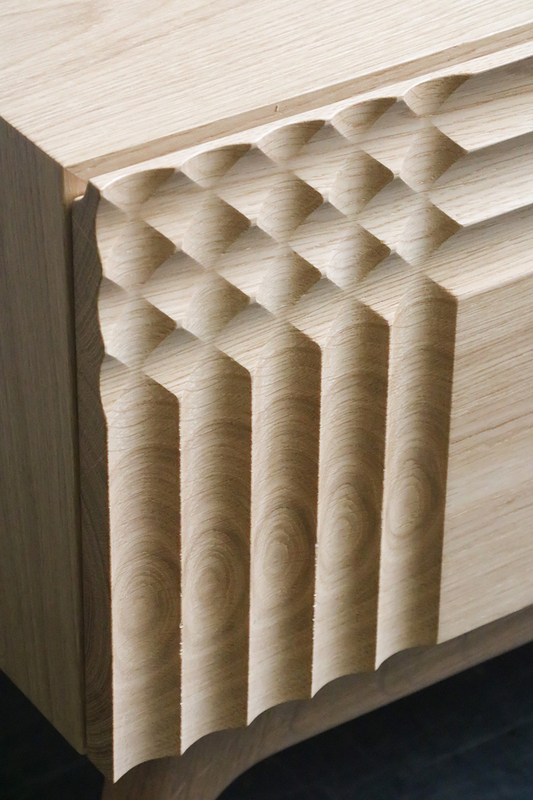 Here’s what caught my eye: Nick James – Flute Cabinet. Really liked the detail there, although I have to admit everything in this article is more a work of art than something to serve a certain function. 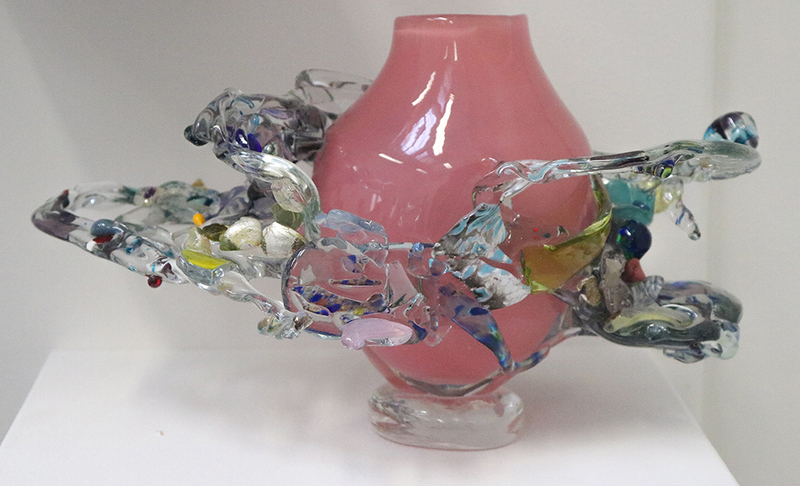 These are pieces that demand space to be shown off, and which you will pass on to the next generation with pride! 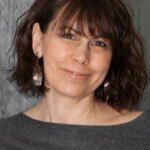 Yes I agree Jenny – if you invest in any of these pieces you are buying a work of art. I have great admiration for all the makers I have featured. I’ve never been to this show before but it looks right up my street. I absolutely adore seeing pieces like these. The craftsmanship that goes into them is amazing. You’ve picked out some really great pieces made by very talented people. Yes you would love it Stacey – it’s worth a trip to Cheltenham. It’s great to see so many beautiful handmade piece and meet the makers that created them. Oh my! 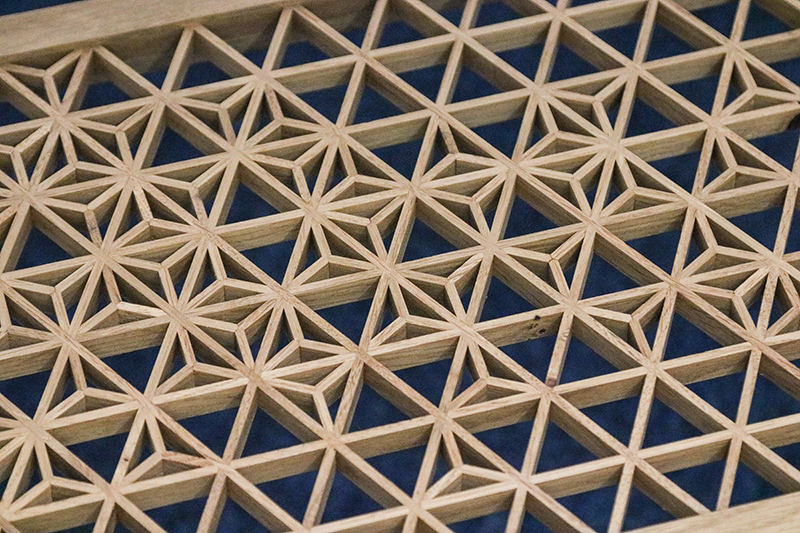 The craftsmanship, creativity and sheer talent that goes into designs like this is just incredible. Some beautiful pieces! 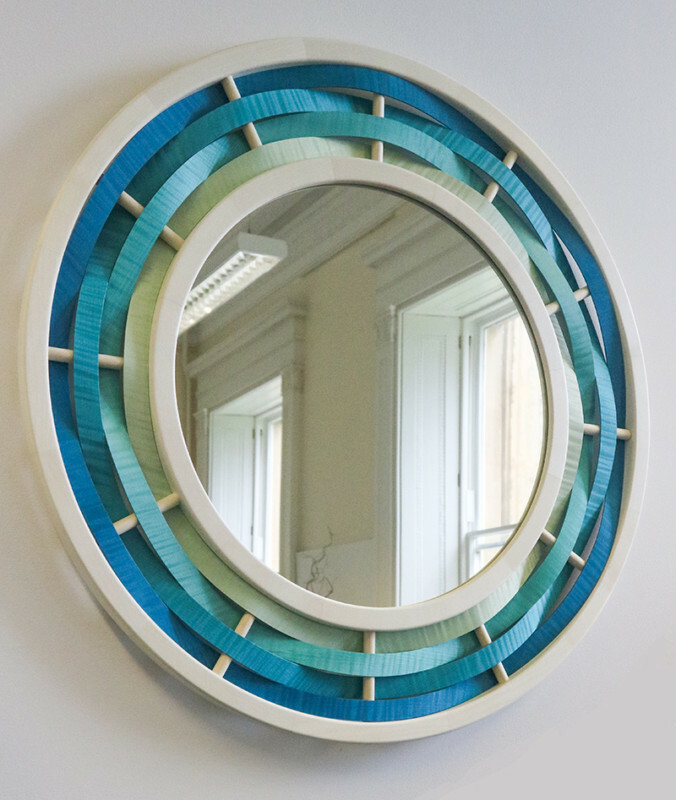 They are incredibly talented craftsmen Hollie. I always look forward to this show – there are justso many beautifully made pieces. 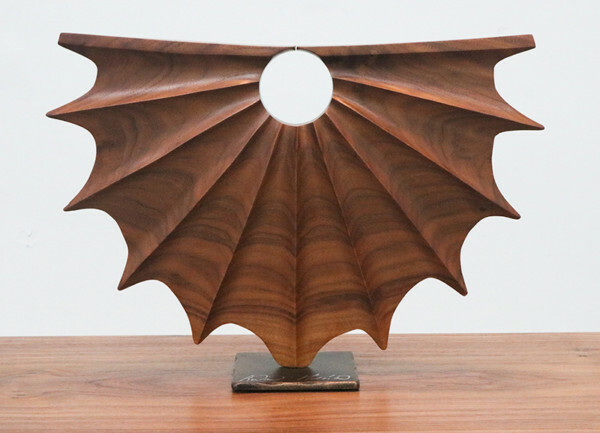 There are some incredible designers out there Pati – it’s always amazing to see the craftsmanship. Don’t you just love the way that table opens out Karen ? – such a clever designer.